The Gila River, with its headwaters in the Gila Wilderness – the nation’s first designated wilderness area – is eminently qualified for Wild and Scenic status. 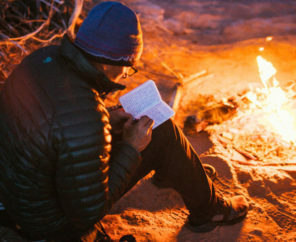 This blog is a guest column by Donna Stevens, Director of the Upper Gila Watershed Alliance, and was originally published in Desert Exposure magazine. We’re all a little bit in love with rivers. Like a teenage crush, we’re first dazzled by their beauty. Soon we crave how they make us feel when we’re near them, like the world is new and everything is possible. We hear their songs, and fall deeper. We realize that rivers feed us, our bodies and our spirits. As we play and fish in them, our joy mingles with their waters. When we grow up, we understand that real love means not just taking what we want, but also giving back. We discover that the river needs something from us, and because we’re in love, we want to give it, protect it from harm. In the early days of this country, there was an expectation that the land and water would always provide for us. To develop and grow, we dammed all the big rivers, and then began to exploit the small ones. In the 1960s, river lovers began to acknowledge that our nation was just taking from rivers, and not taking care. They saw wild rivers disappearing and determined to give back to them in a permanent, protective way. Secretary of the Interior Stewart Udall (Senator Tom Udall’s father) joined the cause. Together, they persuaded Congress to protect the rivers we love, and in October 1968, President Lyndon Johnson signed into law the Wild and Scenic Rivers Act. 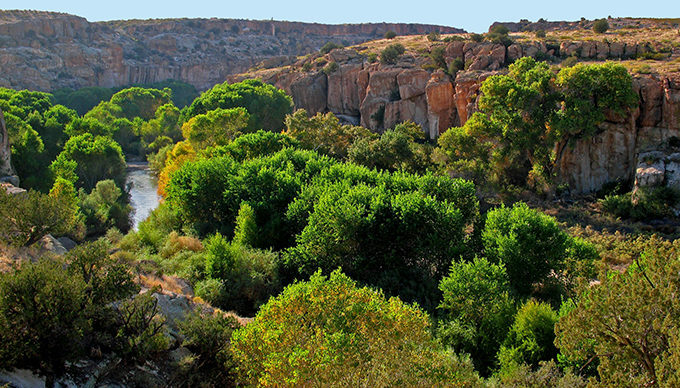 As part of this act, eight rivers, including the Rio Grande in northern New Mexico, with its tributary, the Red River, were immediately designated as Wild and Scenic Rivers. 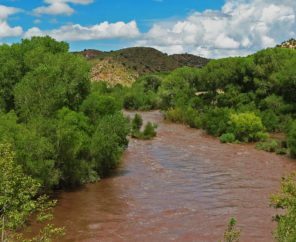 Since then, the East Fork of the Jemez River, the Pecos, and Rio Chama in New Mexico have also been protected as Wild and Scenic. Residents enjoy these rivers, and local economies continue to prosper as visitors flock to them, spending their tourist dollars. 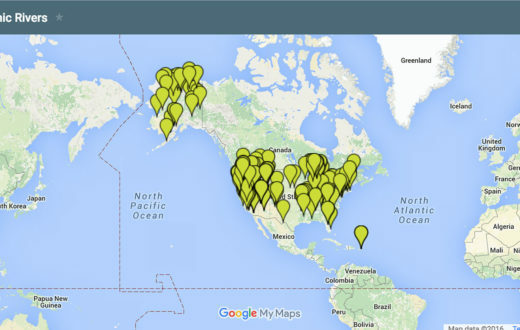 Across the nation, more than 12,700 miles of rivers have received Wild and Scenic River status. Sounds impressive, but that number represents less than one percent of the total river miles in the country. Now is not the time to rest. In the Land of Enchantment, there are no protected rivers in the southern part of the state, and not for lack of deserving river segments. In this arid landscape, rivers and streams are the lifeblood of the land. The Gila River, with its headwaters in the Gila Wilderness – the nation’s first designated wilderness area – is eminently qualified for Wild and Scenic status. 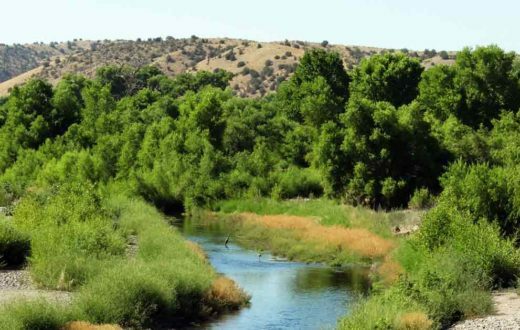 The last free-flowing river in the state, the Gila is unmatched for activities like hunting, hiking, fishing, and just enjoying the outdoors. 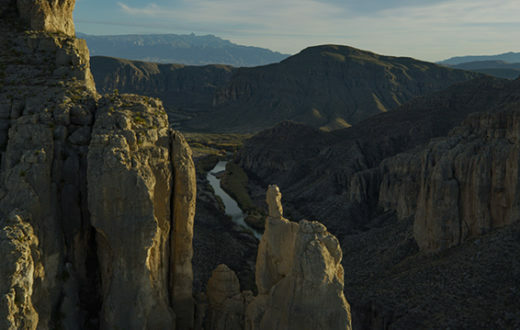 Miles downstream of the Gila’s three Forks – East, West, and Middle – is the Gila Middle Box, a tight canyon of towering pink cliffs “boxing in” the river, with flood debris wedged twenty feet overhead, spanning the river. There are many such wild river segments in the Gila National Forest: the Lower San Francisco, with its soothing hot springs; McKnight Canyon, where the East Fork of the Mimbres is lush and shady; Whitewater Creek above the Catwalk; Black Creek, arising from high headwaters at Reeds Peak in the Aldo Leopold Wilderness. There’s an intriguing litany of history in these names: Indian, Mogollon, Diamond, Sapillo, Turkey, Iron, Gilita, and Little Creeks – not to mention Holden Prong. These streams feed our imaginations and provide a home to native fish, resident plants, and wildlife. 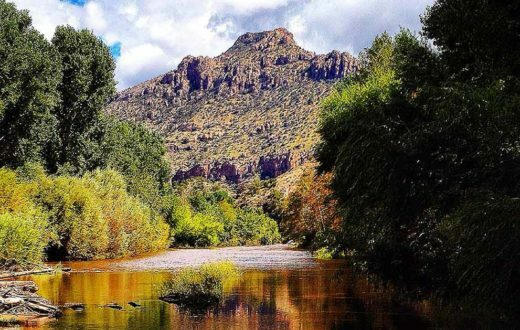 During the 14th Annual Gila River Festival, participants can experience firsthand some of these cool river stretches, and see for themselves why they deserve protection. Because we love these rivers, we want to keep them as they’ve always been. This won’t just happen on its own. Protection, like love, is an active process. Wild and Scenic River designation means that we keep the river as it is now. Proposed projects that would degrade the river – water quality, wildlife habitat, and wild characteristics – would not be allowed. The Wild and Scenic Rivers Act has three designation categories: wild rivers are rivers, or sections of rivers, that are free-flowing and usually reached by a trail. Scenic rivers are also free-flowing, but accessible by roads in some places. Recreational rivers have easy motorized access and often some development along their shores. Demands on our rivers will only become greater as the human population grows. Precipitation and water levels may decrease, and new threats are likely to materialize. Just as we safeguard our beloved children and grandchildren against peril, we need to protect our rivers and streams. It’s time to move beyond a mere crush, send a valentine to our rivers, declare our undying love, and ensure that these rivers get the protection they need and deserve, so future generations can fall in love with them, too. Is the Fourth Time a Charm on the Gila?